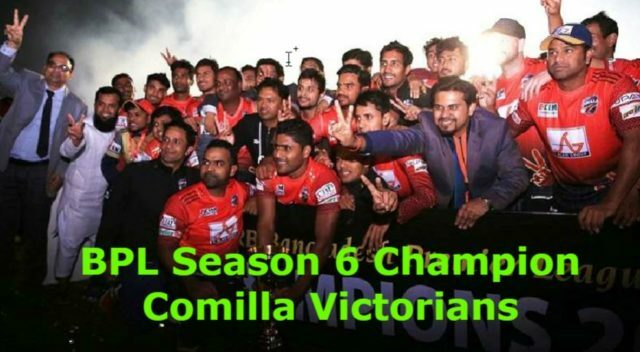 Bangladesh Premier League (BPL) T20 Season 6 Champion Comilla Victorians: For winning have to makes 200 runs. The over was only 20 and they have to make huge runs it was not easy but Dhaka Dynamites loses. Comilla Victoria wins for 17 runs and leaves the field. Dhaka Dynamite player Sakib hit the ball early in the innings. Sunil Narine turns back after being run out in the first over of the over. Then the run rate in Dhaka is 0. Then Roni Talukder came to the crease. Comilla bowlers were able to bowl to bat. Upul Tharanga joined Roni Talukder’s rally after that, Tharanga returned with a 102-run partnership. Before scoring 48 runs scored from 27 runs Then Ranike Talukder was again caught on the bowling bowls of Comilla. Captain Shakib Al Hasan, however, was not able to give Rony more company. Shakib returned to the pavilion after scoring his 120 in the next over to hit Tamim’s wicket. Rony Talukdar could not live up to the order. Chasing a run of 121 runs, the team dismissed 66 runs in 38 balls. However, in the final match, West Indies’ Pollard (13) and Russell (4) Nurul Hasan returned to 18 runs in 15 balls. After the last attempt, Dhaka could not defeat. Earlier, Tamim Iqbal’s three-wicket haul of 199 runs by Comilla Victoria lost three wickets in the scheduled 20 overs to hit the toss. The match starts at Mirpur Sher-E-Bangla Cricket Stadium on 7pm. In finals Tamim Iqbal makes a history in the BPL. In the match Tamim scored 61 runs in 10 fours and 11 fours in an unbeaten 141 runs. BPL, in all T-Twenty cricket, it is Tamim Iqbal’s personal best in one match and the second highest individual in BPL history. In Comilla, Tamim Iqbal and Evin Lewis were the only two openers to start the innings. Lewis returned to the pavilion after being hit by LBW by Rubel Hossain in the 9th over. Before the dismissal, 6 run out of 7 runs. When Luis returned to the outfit, Anamul Haque won the match as Tamim’s partner. With the wicket-keeper batsman, Tamim and Vijay took 40 runs in the Powerplay. Tamim Iqbal, the opener of the team, started the innings but Tamim Iqbal returned to life with 63 runs. Caribbean star Andre Russell has failed to take his catch. Then Shakib was caught by Mohammad Anamul Haque in the 98th over. Before scoring 24 runs of 30 runs then, with Tamim, misreading the ball quickly went out and Shamsur Rahman returned. Then they won the match. Dhaka Dynamites: 182/9 (20 overs). Comilla Victoria: 199/3 (20 overs). Comilla Victoria XI: Tamim Iqbal, Evin Lewis, Imrul Kayes (Captain), Anamul Haque Bijoy, Shamsur Rahman, Shahid Afridi, Thesira Perera, Mohammad Saifuddin, Wahab Riaz, Mahdi Hasan, Sanjita Saha. Dhaka Dynamite XI: Upul Tharanga, Sunil Narine, Rony Talukder, Shakib Al Hasan (capt), Kieron Pollard, Andre Russell, Nurul Hasan, Mahmudul Hasan, Shuvagata Home, Rubel Hossain, Kazi Anik.